Ambisonics is essentialy the attempt to reproduce sound as if it were being performed live. Nimbus Records uses this technique on almost all of its recordings, from chamber music to choral symphonies. 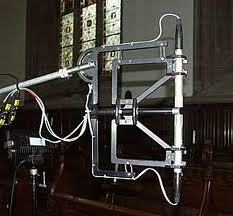 The microphone used captures sound from all angles evenly, whether it be infront or directly behind. Nimbus then use a decoder to reproduce this array of sound on four speakers. However, the typical home speaker arrangemnt comprises of two speakers. To get round this problem Nimbus encodes its CDs in UHJ format (similar to Dolby Surround or DTS used on DVDs) which can be easily decoded back to it's original form should you have the necessary equipment.